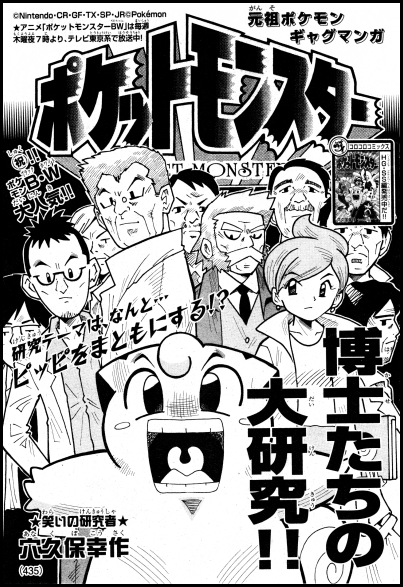 Pocket Monsters Black & White originally started publication in the November 2010 issue of CoroCoro Comics. 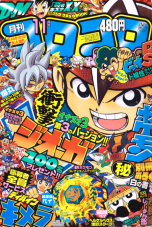 All titles are based on the Japanese language version. 02) "The Professors' Big Study!!" 03) "Welcome to Our Restaurant! We'll Guide You Three to Your Pokemon Battle!!" 04) "Humans and Pokemon Can Talk to Each Other! It Really is Amazing!!" 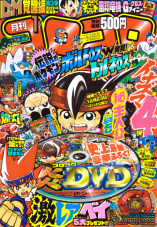 Note: The following summaries will be taken down and replaced with less detailed summaries if Viz ever picks the series up for distribution in the United States. Chapter One "Pippi's Adventure is Also On a New Stage!!" After separating from Balkie, Red and the others are riding a bike when they crash. As they pick themselves up from the crash site, they see themselves surrounded by pokemon they don't recognize. 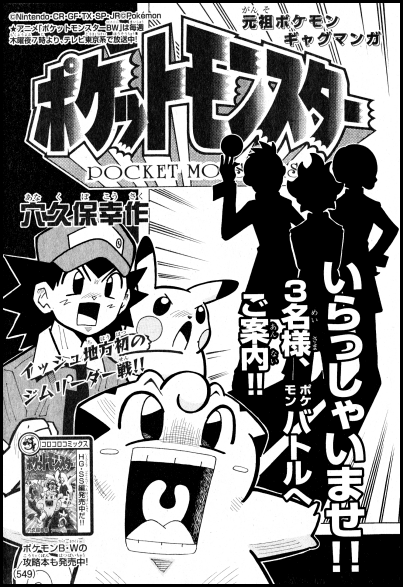 The pokemon are Minezumi, Koromori, Mun'na, and Moguryuu. Red and Pikachu both stand up. Red wonders where in the world they are and who these strange pokemon are. Suddenly, he looks over and sees the strangest pokemon of all! Before long, he realizes that the bruised, bloody creature before him is Pippi! Red tells Pippi that he didn't recognize him because his face was so beaten up, so Pippi responds wiping his face and bragging about how hot he is now! In any case, Red figures, they should hurry up and figure out where they are. A Minezumi approaches them and begins talking, so Red asks Pippi to translate for them. Pippi listens and is perplexed by Minezumi's statement to "look around" (isshuu suru in Japanese) but decides that the pokemon is telling them that if they look around, they'll be able to figure out where they are. Pippi begins to run around excitedly until an annoyed Minezumi corrects him. He was saying that they were in Isshu, not that they should isshuu suru! Red angrily hits Pippi, telling him to translate things more properly in the future. Pippi, now sporting a huge welt on his head and a nosebleed, reckons that Isshu is far removed from the Kanto and Jouto regions. This can only mean one thing; Red and the others are on a new adventure! Pippi tells Red that they can catch more pokemon and add some more friends to the group. Pippi seems excited and ready to go but quickly shows his true colors when he hops into a hammock and tells Red to knock himself out! After Red punches back to earth, Pippi listens to Minezumi tell him that a person named Araragi-Hakase has a laboratory nearby and that they can get a new friend there. Red thanks Minezumi and asks it what its name is. Once he finds out, he tells Pippi to give Minezumi a Berry for all its help. Minezumi is surprised to see the fairy pokemon with the huge pile of Berries that Pippi had been hoarding. However, this sense of surprise quickly turns to annoyance when Pippi flees the scene, leaving behind the tiniest Berry he could find! After some time, Red and the others arrive at Araragi-Hakase's laboratory. As the trio opens the door, Pippi wonders if Araragi-Hakase will be an old man like Orchid-Hakase. When they see the female professor sitting at her desk, Pippi declares that she's not an old man; she's an old woman! Araragi-Hakase begins yelling at them, demanding to know what they meant. Red tries to smooth things over by apologizing and saying that all they can see in the room is a young lady. Araragi-Hakase's rage instantly disappears as if a switch had just been flicked. Pippi and the others are shocked at her sudden transformation. Red tells Araragi-Hakase that he's a trainer. She guesses that he's there to get a pokemon and tells him that he's the 30th person to come to her lab for that purpose. 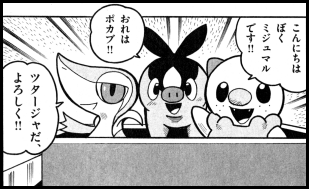 Pippi assumes that she's about to tell them that she's given away all the pokemon she has, but she surprises them by bringing out a box with a Mijumaru, Pokabu, and Tsutarja. After the starter pokemon introduce themselves, Pippi puts on a salaryman costume and hands them a business card! Red scolds his pokemon for being stupid and then turns his attention back to the starters. 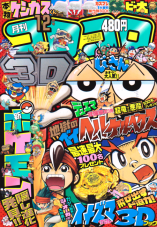 He wonders what pokemon he should get, and Pippi says he likes Pokabu the best. Araragi-Hakase interrupts them and says that she hasn't actually agreed to give him a pokemon yet! She explains that those three pokemon have already been promised to three trainers, prompting Pippi to ask why she didn't tell them sooner. Araragi-Hakase tells Red that he already has an adorable Pikachu, but then she asks if that sumo-looking pokemon over there belongs to him as well. After Pippi and Red re-enact a sumo match, Red tells the professor that he's just his Pippi. Araragi-Hakase apologizes and tells Red that she didn't think they got that fat. Pippi fires back by calling Araragi-Hakase a rude old woman, prompting her to rip a phone book apart in her rage! Red calls her a young lady again, and, like before, Araragi-Hakase's rage cools down almost immediately. Suddenly, Red gets a sly look on his face and tells Pippi that if they kiss up to her, they might be able to coax her into giving them a pokemon. Pippi decides to do this by dressing up in a suit, removing his hat, getting down on one knee, and proclaiming how beautiful she is. Araragi-Hakase is flattered. He continues, saying that her style is outstanding and that she's as lovely as any movie star. Suddenly, the professor spots a book tucked in Pippi's hat entitled "The Book for Flattering Women" (女性をほめる本) and calls him out for merely reading somebody else's words. She then informs Red and the others that she knows what they're trying to do and that they should just give up. Red tries asking again, but Araragi-Hakase won't budge. At that moment, Pippi says that there are plenty of pokemon outside and that they'll just catch their own. After Pippi storms out of the laboratory, Red finds himself impressed with Pippi's new attitude. Araragi-Hakase seems to be happy for Pippi as well. Red and Pikachu rush outside to catch up with Pippi, but he's nowhere to be found! Suddenly, they spot him behind a booth he set up advertising that they're now hiring for new pokemon! Three meals a day and naps included! No experience needed! Red kicks Pippi, telling him that they'll have to get new friends by battling. At the entrance to the laboratory, three unnamed trainers who seem to be based on Touya, Bel, and Cheren approach Araragi-Hakase and tell her that they've arrived to claim their pokemon. The three look at the box containing the starter pokemon and wonder which one they should pick. Bel says she wants Mijumaru, but Touya grabs it and says that Mijumaru is going to be his. Before long, the three begin fighting with each other! Pippi yells at the trio to stop fighting and tells them that they should settle their differences by talking, not through violence! Both Araragi-Hakase and Red look impressed, convinced that Pippi is a nice guy. The three trainers see the errors of their ways and begin to discuss the decision calmly, suggesting they draw lots to determine who will get the pokemon. Meanwhile, Pippi clandestinely sneaks behind Araragi-Hakase and grabs the box containing the three starter pokemon! As Pippi makes a mad dash for it, Red and the others chase after him. Red kicks Pippi, asking him what the hell he thinks he's doing. 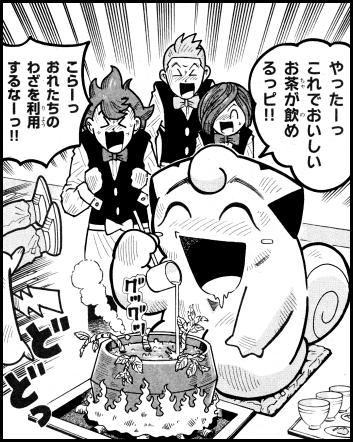 As Mijumaru, Pokabu, and Tsutarja start ganging up on Pippi, the new trainers comment on the fact that a veteran pokemon like Pippi is being beaten by a group of newcomers. Chapter Two "The Professors' Big Study!!" Outside an office building, a banner reading "The First Pokemon Meeting" is draped across the front. Inside, Orchid-Hakase stands at a podium in front of a crowd of professors. Among those in the crowd are Utsugi-Hakase from Jouto, Nanakamado-Hakase from Shin'ou, and Araragi-Hakase from Isshu. Orchid-Hakase addresses the crowd, telling them that they have a big problem on their hands. Nanakamado-Hakase wonders what in the world he's talking about, commenting on how Orchid-Hakase doesn't seem like himself. Orchid-Hakase draws everyone's attention to a monitor broadcasting images of Red's Pippi! The images of Pippi sleeping, eating, and picking his nose cause everyone in the crowd to do one giant facefault. Utsugi-Hakase yells at Orchid-Hakase for bringing them all out there for this, but Orchid-Hakase responds by saying that the problem isn't just with Pippi. He tells everyone that Pippi is making pokemon everywhere look bad and proposes that they bring Pippi in, study his behavior, and then take steps to re-educate him. Nanakamado-Hakase wonders how Pippi can be lured to their meeting, with Utsugi-Hakase adding that he wouldn't willingly come if he knew what they were planning. Orchid-Hakase takes out a Berry and tells everyone that it'll be OK. Suddenly, Pippi bursts through the building's glass door and snatches the food out of Orchid-Hakase's hands! As Pippi gorges on the piece of fruit, Orchid-Hakase explains that Pippi will show up wherever there's food. Outside, Red and Pikachu wonder where Pippi ran off to. Back at the meeting, Utsugi-Hakase scolds Pippi for not taking their research (kenkyuu) seriously. Suddenly, Pippi dresses up like a salaryman and starts bowing profusely as he apologizes for taking a bunch of days off from work. Orchid-Hakase slaps him and tells him that Utsugi-Hakase said kenkyuu, not renkyuu ("consecutive days off"). Utsugi-Hakase and Araragi-Hakase begin to laugh, so Orchid-Hakase yells at them for encouraging the pokemon. The professors in the room begin to gather around Pippi and wonder where they should start their research. Utsugi-Hakase suggests they start with checking his height and weight. Pippi's face suddenly goes pale as he tells everyone that he hadn't prepared yet. With that, he strips down to his boxers - even though he wasn't wearing any clothes to begin with - and tells the professors that if he had known they were going to do this, he would have taken a bath the night before and put on fresh underwear this morning. 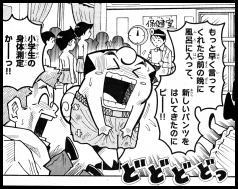 As other small students, all in their underwear, begin lining up in front of a nurse's room, Orchid-Hakase yells that this is not an elementary school health check. Utsugi-Hakase adds that Pippi doesn't need underwear, something Pippi hadn't thought about. Pippi steps up on the scale, and Utsugi-Hakase reads the results. He tells everyone that Pippi hasn't grown an inch since the last time and that he's so heavy they can't measure him properly. Pippi starts to humbly laugh, so Orchid-Hakase tells him that those weren't compliments. Orchid-Hakase then shows Pippi the monitor the professors were looking at earlier. The display shows Pippi napping, eating sweets, and standing in a long line. Orchid-Hakase begins to complain that Pippi just takes naps, stuffs his face without ever worrying about what anyone else thinks, and that breaks battle appointments to go wait in line at the ramen shop for five hours at a time! He then explains that they'll make him more pokemon-like by making him battle. At that, Pippi begins to stuff his face with a box filled with Berries. Utsugi-Hakase asks what's going on, and Orchid-Hakase tells him that in order to boost his energy level, he thought it'd be a good idea to give him some nutritional supplements first. Utsugi-Hakase gets excited at the idea of Pippi going into "Serious Mode" but is quickly disappointed when the pokemon's belly swells until it can no longer move! Orchid-Hakase yells that they're not there to train his stomach. Utsugi-Hakase concludes that Pippi has no physical ability due to the poor shape he's in. Pippi vehemently denies this, boasting that he can run 100 meters in 9.45 seconds, can do a nine meter broad jump, and run a full marathon in two hours and five minutes. Utsugi-Hakase is impressed until Pippi reveals that those are merely his targets. Next, Nanakamado-Hakase suggests they try pumping up Pippi's battle strength, causing the pokemon to get fired up and tell everyone to bring it on! Whether it's Pichu or Py or Marill, he says, he'll beat them! 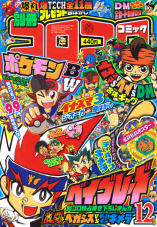 Orchid-Hakase points out that he's only naming pokemon smaller than him. Suddenly, with a loud thud, Giratina appears and says that it'll be Pippi's opponent! Pippi wonders what in the world it's doing there, so Orchid-Hakase explains that they made a special request to have it come there to battle. Giratina looks down at Pippi and tells it to hurry up. Orchid-Hakaswe wonders how Pippi will fight Giratina since it can't use any techniques. At that moment, Pippi pulls out a book entitled "The Book of Pippi's Attacks" (ピッピの技の本) and asks Giratina to give him a minute! As the professors fall over in shock, Giratina laughs at how much guts Pippi has. The fairy pokemon slams the book shut and tells his opponent that he's ready now. The battle starts with Pippi marching over to Giratina and using Finger Wag ("Metronome"). The attack has no effect, so an angry Pippi releases Stay With this Finger ("Follow Me"). Giratina laughs, wondering if finger-based attacks are all Pippi can use. 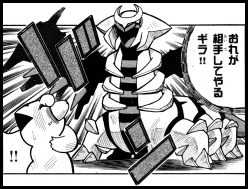 Orchid-Hakase sees what Giratina is saying and tells Pippi that it needs to use techniques that make use of his entire body, not just his fingers. Pippi gets a determined look on his face, jumps forward...and uses Sleep. Orchid-Hakase slaps him awake, telling him not to use only the techniques he wants. Giratina becomes fed up with Pippi's fooling around and leaves. Utsugi-Hakase concludes that Pippi cannot be taught. Nanakamado-Hakase disagrees and points out the fact that Pippi didn't give up and stuck the fight out until the end. He adds that it's their job to find a way to nurture this determination of his and that they shouldn't expect results right away. Orchid-Hakase agrees with him. Utsugi-Hakase steps forward at this moment and tells him that he disagrees, saying that the two of them are old men and therefore have outdated ways of thinking. The three begin to fight, punching each other as a large Looney Tunes style cloud of smoke envelops them. Pippi tries to break up the fighting, but one of the professors kicks him in the head while calling him fat. The fight continues until a gavel hits a podium. When the professors look up, they see Pippi standing at the same podium Orchid-Hakase was standing at earlier while the monitor behind Pippi displays an image of the professors fighting one another. Pippi tells everyone that they have a big problem on their hands, and the professors apologize and look on in horror at what they've become. The three stop for a second, however, as they realize that the reason they were fighting in the first place was because of a disagreement over Pippi. The chapter ends with the three professors ganging up on Pippi and attacking him. Chapter Three "Welcome to Our Restaurant! We'll Guide You Three to Your Pokemon Battle!!" 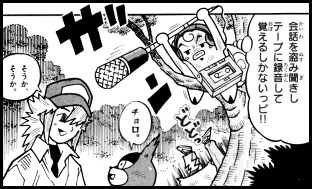 Red, Pippi, and Pikachu are standing in the forest, cursing Araragi-Hakase for being too stingy to give them a pokemon. Red pulls himself together and states that they'll just have to catch some new friends themselves, and this gets Pippi all fired up. Suddenly, Pippi points to a nearby restaurant and tells everyone that they should head there to have a light snack! 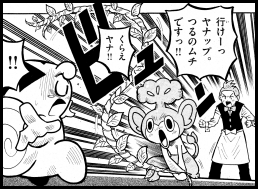 Red yells at Pippi for being stupid, but his pokemon says that he won't be able to do anything on an empty stomach. Red and his pokemon enter the restaurant. Three shadowy figures stop what they're doing and look toward their new customers. Pippi approaches one of them with a menu and asks for a mega-sized plate of pasta, and the waiter returns with a plate of spaghetti as big as Pippi! "This isn't a 'light snack'!," yells Red. Before Pippi can dig in, however, the waiter who brought the plate to the table quickly jerks it away. He then tells the pokemon that this isn't an ordinary restaurant. The three waiters announce that they are the Gym Leaders for Sanyou City! Their names are Pod, Corn, and Dent, and they're all brothers. Red wonders what kind of self-respecting Gym Leader would walk around in an apron, so Pod presents their Gym Badge as proof that they're who they say they are. Pippi starts to get focused, causing everyone in the room to stare at him to see what he's going to do. 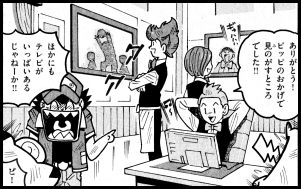 A moment later, Red's pokemon leaves the restaurant, claiming it's all too complicated for him! 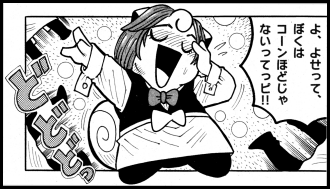 Red drags him back into the restaurant and tells him that he has to fight at this Gym, but Pippi simply falls to his knees and tells his trainer how he just wants to eat at a regular restaurant. Pod takes out one of his Monster Balls and prepares for battle. Pippi rushes over to stop him and says that they should quit the whole Gym Leader business and turn their restaurant into a "Hot Guys Restaurant" (イケメンレストラン) instead. The brothers start to blush. A few taps of a hammer later, Pippi reveals that he's completely renovated their restaurant! A marquee featuring the trio is installed at the front of the restaurant, and a sign beside it reads "Open from Today." Pippi runs down the street, throwing leaflets around haphazardly. Before they know it, Pod, Corn, and Dent find their restaurant filled with people! Their "Hot Guy Restaurant" is a huge success! Feeling that this has gone on long enough, Red scolds Pippi for ignoring his duties as a pokemon and the Gym Leaders for encouraging him. The three brothers start to talk about which one of them is the best looking. Corn tells Pod that he's the best looking, and Dent agrees. Pod modestly disagrees. Red and Pippi look on, flabbergasted. The brothers continue with Pod saying that Dent can't lose to him in the looks department. Pippi jumps in, dressed up like Corn, and declares that he's the best looking. Pod scolds him for butting in, but Pippi says that he thought he should join in the conversation since he's just as hot as they are. Dent and Corn vehemently deny this claim. Pod approaches Red and tells him that they're a trio of brothers who always get along. In fact, they've never been in an argument, not even once! Pippi gets into Pod's face and tells him that he'll mess up their teamwork by instigating a fight! He starts by presenting the trio with a whole cake. He tells them that there's now way for them to cut the cake into three perfect pieces, and that therefore they won't be able to share it equally. The brothers solve this problem by cutting the cake into four pieces instead. Pippi tells them that there's still one piece left and that they won't be able to stop themselves from arguing over it! Dent unexpectedly gives the last piece to Pippi, and, without thinking, the fairy pokemon swallows it in one bite! Red hits Pippi, telling him that he's thwarting his own plan. Pippi's next scheme to tear the brothers apart involves TV. He turns the TV to a soccer match and catches Pod's attention. Next, he changes the channel to a comedy program, getting Corn's attention. Finally, he turns the channel to a crime movie, piquing Dent's interest. Pippi lets out a maniacal laugh, saying that there's no way for the three of them to watch whatever they want at the same time. He's won! Pi ha ha ha! 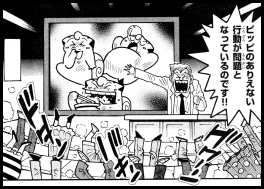 Pippi's laugh dies, however, when he sees the Gym Leaders watching their shows on three separate monitors! The restaurant has multiple TVs, so the brothers are able to watch whatever they want, whenever they want. Pippi gets desperate and hits the breaker switch to turn the power off. The inside of the restaurant becomes dark, and the TVs have cut off. Corn tells Dent that he can't watch his show anymore, and Dent yells at him not to take it out on him. Pippi looks on with a look of glee on his face, waiting for the explosion to happen. Suddenly, Pod steps to his brothers and tells them to forget about TV; they're Gym Leaders and it's their duty to battle, no matter what! Dent agrees with Pod, and Corn says that they should stop fighting. Red and Pippi look on in disbelief as the brothers huddle together and hype themselves up for their upcoming battle. Red yells at Pippi for strengthening their brotherly bonds instead of breaking them. The Gym Leaders are now serious! Dent sends out Yannap, Pod sends out Baopp, and Corn sends out Hiyapp. Red tells Pippi to be careful and explains that the pokemon he'll be facing are grass, fire, and water types. Pod tells his brothers to leave it to him, but the others start to protest and say that they should be the ones to battle. Pippi laughs to himself; the brothers are finally fighting amongst themselves! Suddenly, Pod and Corn decide to let Dent go ahead and start things off! Dent orders Yanapp to use Vine Whip. The attack hits, causing Pippi to shout out that it's strong. Next, Corn's Hiyapp attacks with Water Gun, hitting Pippi's face with a high pressure jet of water. Finally, Baopp attacks with an unidentified fire attack. Suddenly, they see Pippi sitting in front of them with a pot of green tea! Pippi used the fire from Baopp's attack to heat the water from Hiyapp's Water Gun, and then added the leaves from Yanapp's Vine Whip to make a pot of green tea! After the brothers yell at him, they decide to rest and help themselves to some of Pippi's tea. As the four young men sit down, Red throws Pippi's tea on him and tells him that now's not the time for rest. 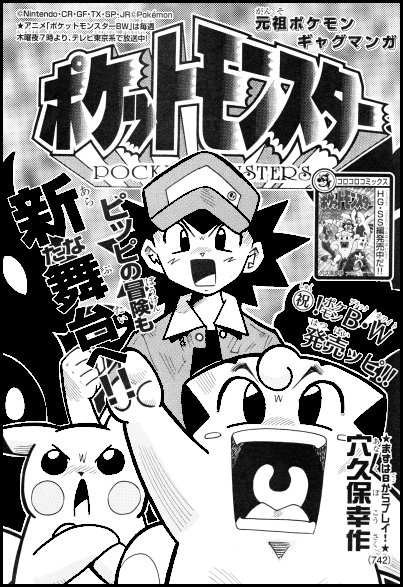 Chapter Four "Humans and Pokemon Can Talk to Each Other! It Really is Amazing!!" Outside, Pikachu is using an electric attack against a Hihidaruma. After the attack, Pikachu drops to its knees and starts panting with exhaustion. Red tells him to keep going, prompting Pikachu to start shouting back at its trainer. "PikaPika, PikaPika Pi-kakapi!!" Red tries to figure out what Pikachu's trying to say to him, but he isn't able to. 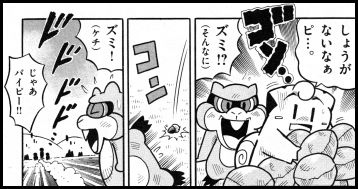 Meanwhile, the Hihidaruma's trainer starts yelling at Red to hurry up so they can continue their battle. Red thinks to himself that if only Pippi was there, he'd be able to translate for him. At a nearby supermarket in the forest, Pippi is pigging out on free samples. An employee yells at him to go ahead and buy something already. Back at the battle, the Hihidaruma trainer checks his watch and says that he has to go. The Plasma-Dan will be giving a speech soon, and he doesn't want to miss it! Red has heard of the group before and decides to go check them out. A crowd has gathered around a stage where two members of the Plasma-Dan address the crowd. Both are holding up picket signs; one reads "liberation" (解放) while the other reads "freedom" (自由). The two members start telling the crowd that pokemon should be liberated and that the group's only goal is to free all pokemon. Red sees the demonstration and thinks to himself how the Plasma-Dan seems to be a group that really cares about pokemon. On-stage, the Plasma-Dan members laugh to themselves as they think about how they'll be able to come in and scoop up everyone's pokemon after they've all been released. Suddenly, Red hears Pippi's voice shouting from the distance. When he turns around, he sees that Pippi is supporting the Plasma-Dan and their ideas of freedom for pokemon! As Pippi holds up a sign that says "liberation," he tells everyone gathered around that pokemon should be freed and given delicious meals and live luxurious lives in hotels. Red yells at Pippi for just being selfish, but Pippi responds that being put in a fancy hotel is proof that a trainer cares about his pokemon. Pikachu joins in, but since Red doesn't understand pokemon speech, he assumes Pikachu's agreeing with Pippi. A voice from the distance tells him that that's not the case. A young man with long hair and a cap appears and asks Pikachu if what he just said is correct. Pikachu responds, and the two seem to carry on a conversation for a while. 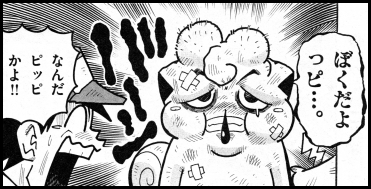 Red is shocked at what appears to be his ability to understand pokemon speech. Pippi asks the young man who he is, and he responds by saying that his name is N. He explains that he's been living together with pokemon since he was little and that pokemon speech is second nature to him. Red crosses his arms and brushes him off, claiming that he can understand pokemon speech just as well as long as they talk slowly enough. Pikachu approaches Red and starts to speak. Red smiles knowingly, leading Pippi to believe that he can actually understand what he's being told. However, Red's request for Pikachu to speak even slower causes everyone to fall over in disbelief. It looks like Red can't understand his Pikachu at all! Pippi calls Red out as a liar, causing Red to angrily respond that he could do what N does if he only studied. 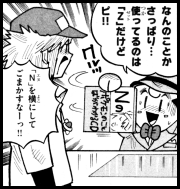 N speaks up and explains that Pikachu was telling Red not to even bother trying to understand him since its impossible. Pippi suddenly gets the idea to ask N to teach them how to communicate with pokemon. Red remembers the battle with Hihidaruma and thinks to himself how useful that ability would have been back then. He approaches N and asks him how he does it, but N refuses to tell him. He tells Red that it's not something you can teach and that it's useless to ask. He turns to his Choroneko, who had apparently been standing behind him the whole time, and tells it to come along. Once they're out of everyone's earshot, N starts to talk with his pokemon. Red and Pikachu see N talking and are amazed that he's able to understand the language of many different types pokemon. Pippi, meanwhile, starts to climb a nearby tree. Armed with a pair of headphones, a tape recorder, and a boom mike, Pippi camps out on a branch and starts recording N's conversation. When he's finished, Pippi brings the tape recorder to Red and tells him that he was able to make a perfect copy! Red puts on Pippi's headphones and starts to listen to the tape. After some time passes, Red decides to test his new knowledge with his Pikachu. Pikachu starts to talk, and Red listens. When his pokemon finishes, Red announces that Pikachu said that since the sun is going to be going down soon, they should gather water and firewood for the night. 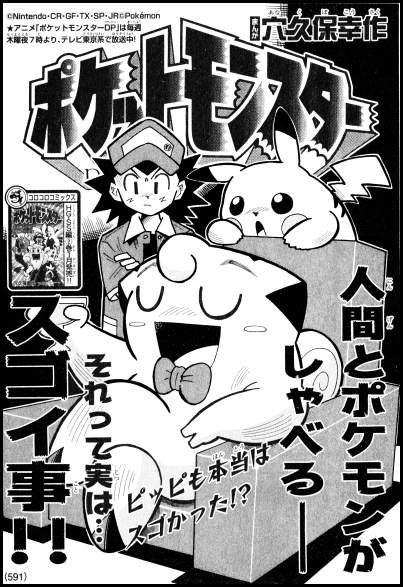 Pikachu happily confirms that he did say that, meaning that Red is now able to understand pokemon language! After Red cheers, Pippi starts to cheer as well! He can print CDs of the conversation he recorded and sell them for a lot of money! After printing a bunch of copies, Pippi begins selling his CDs. At first it doesn't look like anyone's interested, but before long a large crowd starts to gather. Word of Pippi's CD begins to spread and the product becomes a big hit. Stores begin to sell out of all their stock, and it isn't long before Pippi is able to afford his own office building! Inside, Pippi sits at a large desk wearing a suit. Red and Pikachu can't believe all this is happening. Suddenly, N bursts into the office! Pippi greets N with a cheerful "long time no see," but N immediately starts yelling at Pippi for using his name without permission. Pippi says that he doesn't know what he means since all his CDs clearly have "Z" printed on them. After N points out that Pippi's merely holding the CD case sideways, Pippi angrily tells N that he has no more use for him and to leave right away. At that moment, one of Pippi's employees enters the room and tells him that sales of his CD have started to slow down. Pippi stops and thinks about how he needs to get another recording so he can make a new CD. Pippi sheds his old demeanor and puts on a happy face as he cheerfully invites N to dinner! N refuses, saying that Pippi will just record his voice again without his permission. Pippi's face becomes grim as he reminds N that he has a lot of fans who will be crushed if they aren't able to release another volume. N starts to back up against the wall, telling Pippi to stay away from him. Then, without warning, Pippi lunges at N and knocks him over! N starts to hold up signs similar to the ones the Plasma-Dan had earlier demanding "freedom" and "liberation." As he's pinned to the ground, N yells how humans should be free and begs to be liberated from Pippi. Red hits Pippi on the head, telling him that enough is enough. N, meanwhile, makes his way over to Pippi's laptop and starts rerouting the income made from the CDs to help pokemon in need. At that moment, Pippi wakes up from his dream. As he runs away from a group of angry customers who claim that his CDs don't teach them anything, Red and Pippi merely shrug their shoulders..